I had been hoping to buy myself an EZ Dresden template on my recent visit to San Diego but the shop was out of stock. The universe provided an alternative in the form of Mikarah’s tutorial where she posted instructions on how to make your own template. Making your own template is cheaper and more environmentally friendly than flying from Australia to the United States to go buy one. My beloved helped me with the template, after just a little begging. I drew the template on heavy paper first, and he helped me transfer the design to the template plastic. I cut sixteen petals out of two orange tones from my stash, not sure whether I’d got the template right enough for them all to fit together when all the seams are in place. 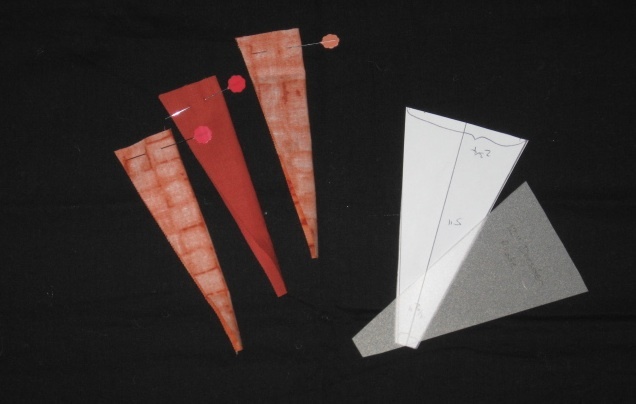 First step – sew the points. I used my new long flat pins to help me with the alignment. I like using them, but because they’re so long and thin, they feel a bit bendy compared to my regular glass-head pins.The flat pins were lovely for the applique part of the project and I’ll put them aside for that in future. It turns out sixteen petals was too many. I got a complete circle with fourteen petals. Maybe my quarter inch seam was a little too scant or maybe I didn’t cut the template quite right. Either way, it was a good experiment. The main thing I learned – I’m not sure I’ll bother making another Dresden Plate. I admire them when others make quilts out of them, but for me the effort just wasn’t worth the result. 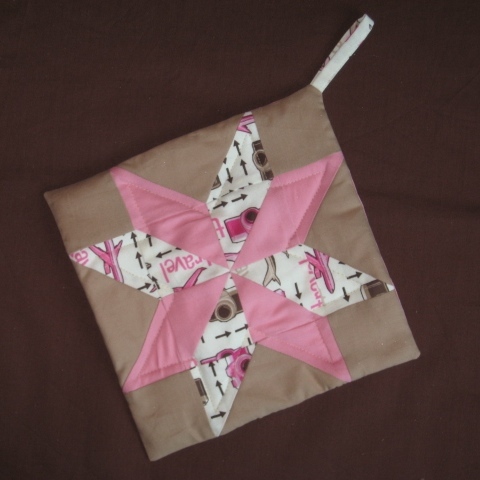 I did enjoy tying the quilt sandwich and I like the effect so I think I’ll do that again. I also enjoyed machine appliqueing the blades to the background fabric, even though it was a bit fiddly. 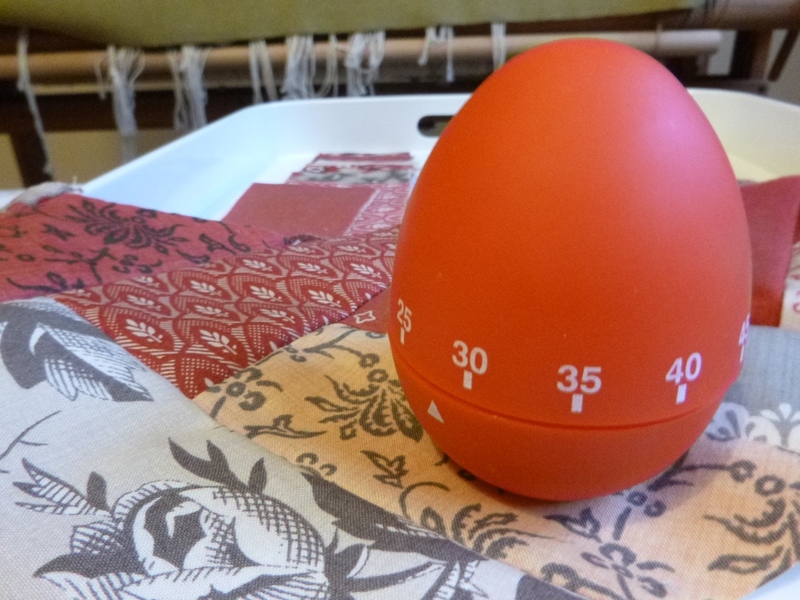 I used my sewing machine’s blanket stitch for the central bright orange element and a narrow zig-zag around the outside. 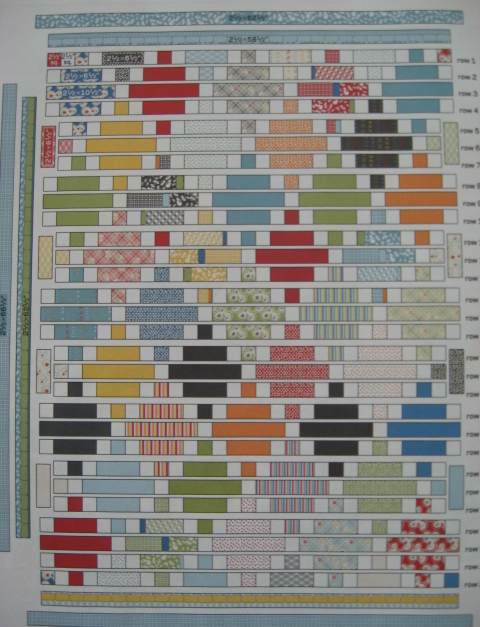 This will be a doll quilt for a future swap, most likely. It’s the perfect size, at 15 inches square. Simple Construction – Oh Really? 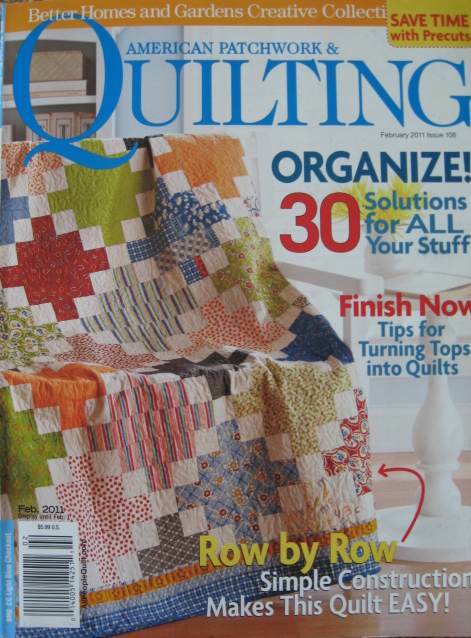 I picked up the Feb 2011 issue of American Patchwork and Quilting on my travels because I was drawn to the quilt on the cover, designed by Sandy Klop of American Jane Patterns. 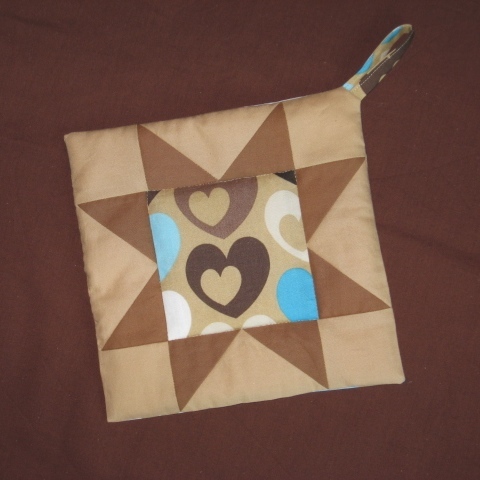 It’s designed to be cut from 21/2 inch strips, complemented by muslin spacers – 240 of them, as 21/2 inch squares. I’m still thinking about making it, but I’m wondering if it really a beginners level design, as stated. I’m wondering how to efficiently get all 29 rows together correctly without having being up and down from my design floor after every seam. Plus, I don’t really want a work in progress on the floor for weeks or months. Any suggestions? I could mark each piece of fabric as a1, a2, a3 etc using masking tape but surely there’s a better way. Please share your handy hints by leaving a comment. 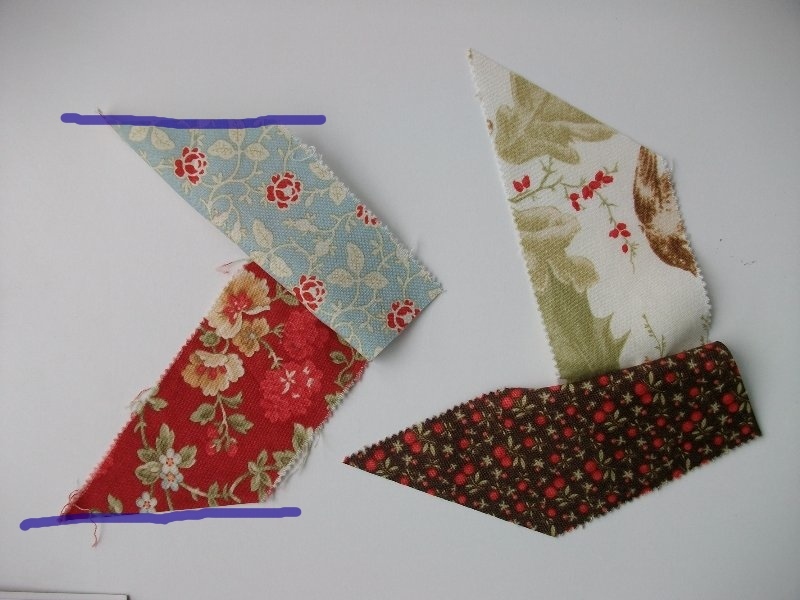 Update: The ever-reliable experts on the Quilting Board had two brilliant suggestions. 1. Cut the fabric and place it in labelled baggies baggies in order of sewing. Label the baggies and the rows. 2. Take a photo of the layout before you start, to use as a reference later. 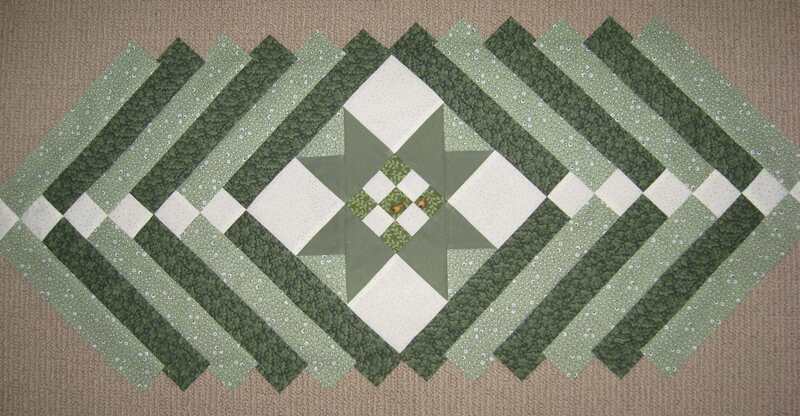 The About.com:Quilting site’s pages about the modified Dolly Madison Star block have a couple of example quilts, one of which was set on point. It has a vitality that I love. Today I made 13 nine patch centre squares to get that one started. The quilt I envision will be in purple tones, some bright, some less so. I scored two lots of background fabric in pale purple tones in the Spotlight remnant bin a while back (another bargain purchase) and I’d had in mind to use them in a purple toned quilt for a while. I’d also had in the back of my mind that I really need to learn to set a quilt on point. That’s really just a fancy word for on the diagonal, but the term sounds balletic to me. 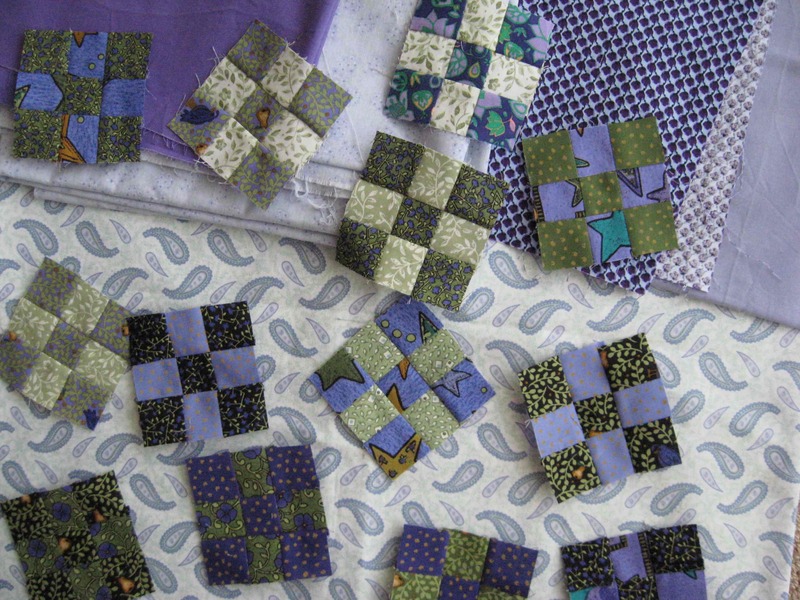 I don’t think it’s going to be all that hard – the two main challenges will be assembling the quilt in the right order and cutting the half squares and quarter squares the right size. I enjoyed the modified Dolly Madison Star block for the table runner so much that it called out to be made again. Never mind that the table runner still needs to be trimmed, quilted and bound or that the tumbling spools quilt is waiting for its sashing. 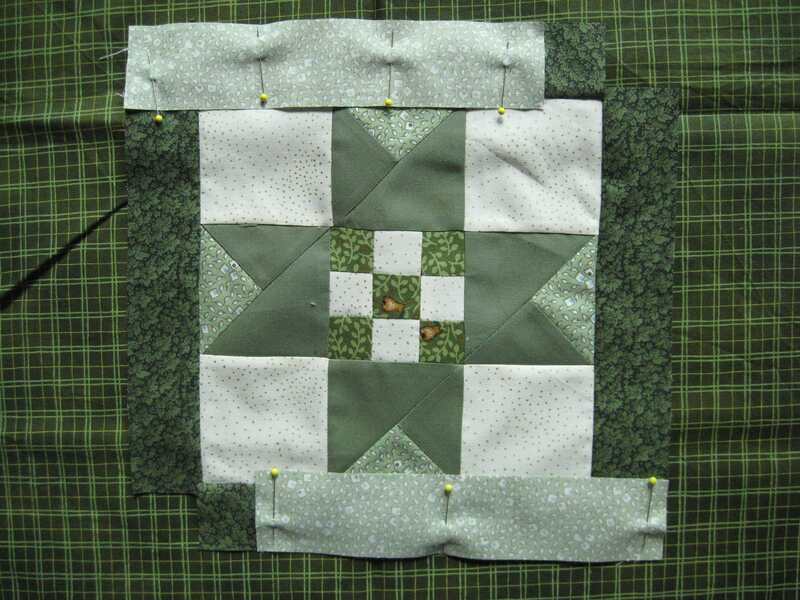 The teeny nine patches in the centre of the modified Dolly Madison Star block are a bit fiddly as they start life as one and one half inch squares but they’re cute and after a while piecing I found myself having a good rhythm. My rhythm was better than my counting though. I initially cut enough squares for 13 nine patch blocks, then miscounted and only made up 12. I really wish I would learn to count. I have been confined to quarters, as it were, for the weekend, suffering a heavy cold. I was unable to accompany my beloved to Sydney for what was supposed to have been a fun weekend getaway. Flying with blocked ears is a pretty silly idea (I know from experience), so I sent him away by himself, with instructions not to talk to any strange women. Being confined to the house (except for a quick trip to pick up some essential supplies, more of which later) I spent way too much time reading the Quilting Board. There was a thread on the board that directed me to a free pattern for a braided table topper. I am a fascinated by braided designs and I decided to give it ago, as a practice piece for the friendship braid quilt and so I could have it ready as a holiday gift. I had planned to use a Christmas print left over from last years sales, but I decided the red in that fabric was just too harsh to use on this project. 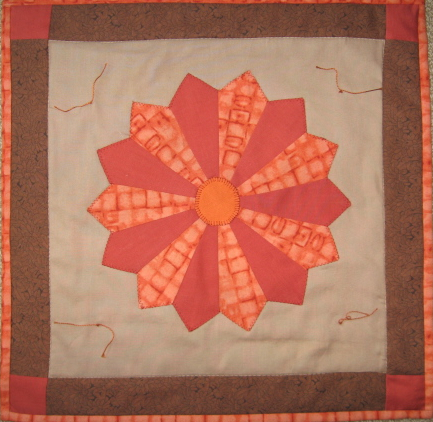 I decided a star would be the ideal thing for the 9 inch centre block and picked the Dolly Madison block from the ever faithful About.com:Quilting site. Of course I messed with that pattern just a bit. 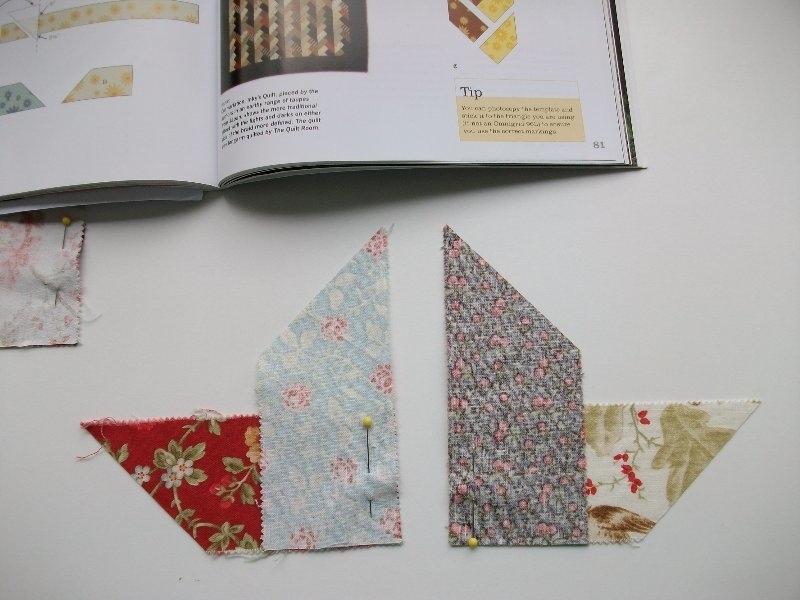 The nine patch blocks are gold on ivory and a partridge in a pear tree print. Well, that’s how I interpret it anyway. I must also mention my quick trip to the shops. I needed chicken stock from the supermarket, which happens to be located in the same complex as the Spotlight fabric and party supplies store. I decided to whizz through Spotlight to check if they had any bargains. They did! The remnant box had a package containing about a metre of aqua toned 100% cotton quilting fabric and roughly two metres of a black and ivory print, priced at $2 for both. I had seen the blue fabric on the bolt in the quilting section but didn’t like it enough to buy it there. But I liked it more than enough at $2. I’m sure we learned about that price value equation in Economics 101, though I seem to recall that Economics 101 had a notion of a rational man. In my 20’s I would have been far too shy to talk to a 20-something alpha-male type. Now, in my 40’s I teased him until he blushed. Middle age has its compensations.